Just a year after the release of Philadelphia Classics-The Tom Moulton Remixes, now lovers of vinyl will be able to purchase a copy of what was one of the most anticipated box sets of 2012. While the four CD box set of Philadelphia Classics-The Tom Moulton Remixes that was released in March 2012, lovers of good old fashioned vinyl, were left drooling jealously. Now a year later, Harmless Records have rectified this with Philadelphia Classics-The Tom Moulton Remixes-Special Vinyl Edition. This new vinyl version, which will be released on 25th March 2013, features eight heavyweight 180 gram vinyl albums. To ensure maximum fidelity, the thirty-one tracks have been resequenced, resulting in a very different running order. For lovers of Philadelphia International Records and Tom Moulton’s remixes, then you’re in for a treat. Philadelphia Classics-The Tom Moulton Remixes, featured thirty-one of Tom’s remixes. This included fourteen of his classics and seventeen new tracks. On its release, Philadelphia Classics-The Tom Moulton Remixes was hailed as one of the box sets of 2012. A year later, it’s the same story, and a case of get your orders in soon, as stock is limited. Truly the music on Philadelphia Classics-The Tom Moulton Remixes was stunning. The same can be said of Philadelphia Classics-The Tom Moulton Remixes-Special Vinyl Edition. It’s a fitting tribute to Tom Moulton, one music’s innovators, and whose influence on dance music has been huge. Without Tom Moulton, there would have been neither remixes nor twelve inch singles, and doubtless, the history of DJ-ing would be very different. Single-handedly Tom invented both the remix and twelve inch single, while creating some of the best remixes in the history of music. Before I tell you about the music on Philadelphia Classics-The Tom Moulton Remixes, I’ll tell how Tom Moulton inadvertently invented both the remix and twelve inch single. How Tom Moulton invented the remix is a fascinating tale of how fate and being in the right place at the right time can change history. Throughout Tom’s career, he’d been steeped in music. His first position was a junior promo man for United Artists, RCA and then King Records from the late fifties onwards. By the late sixties and disillusioned with the dishonesty and corruption that scarred music, Tom left the music industry. From there, he became a model, working on photographic shoots and on the catwalk. While he was making a comfortable living, his real passion was music, it was in his blood and what he loved most. However, when a colleague in the modelling industry invited him to Fire Island to a diner and club the Sandpiper, he’d have a eureka moment that would change his life and music. Having made the crossing on the ferry from New Jersey and arrived at the Fire Island, Tom headed to the Sandpiper, where he’d change musical history. When watching a DJ at the Sandpiper he was matching the resident DJ mix the old seven inch singles. It was then he realized that just when dancers were gaining momentum and getting into the groove, the single was over. After this there another single was mixed in and the same thing was happening. Realizing this must be hugely frustrating for dancers and DJs, Tom decided to rectify the problem. Back home, he spend nearly a week editing a forty-five minute reel-to-reel tape designed keep the dance floor going. Now this wasn’t easy. He extended parts of tracks, looping the most exciting parts and ensured there was a seamless changeover between tracks, so much so, that dancers hardly noticed it. Using his own collection of soul music, the tape was compiled, but this hadn’t been easy. It meant editing the tape using razor blades, tape and fluid, constantly joining and rejoining the tape. Dexterity, patience, skill and an ear for music were needed, but Tom had all that. So after a week, the tape was finished, and was given to a DJ at the Sandpiper. The result was as he’d expected, the dance-floor loved it. This would be Tom’s first step on the road to remixer extraordinaire. Having made his first disco mix, Tom set about finding tracks to remix. This turned out to be relatively easy, mainly because Tom wasn’t a DJ. The reason for this was radio was still King, with DJ’s in clubs and record companies neither communicating nor perceived as important in the great scheme of things .This is very different from today. So, when Tom approached record companies to remix one of their tracks, then often they say yes. Starting with The Carstairs’ It Really Hurts Me Girl, remixed by Tom for Red Coach Records, Tom’s nascent remixing career was underway. By 1974, Tom Moulton had perfected his craft, remixing BT Express’ Do It Till You’re Satisfied. Although the group didn’t like the track, Tom’s remix became a big hit. Suddenly, Tom was remixing Gloria Gaynor, Loleatta Holloway, Eddie Kendricks and First Choice. By now he’d arrived, with the Tom Moulton remix a surefire sign of quality. Having invented the remix inadvertently, fate intervened again, with Tom inventing the twelve inch single. The first twelve inch single was made cut purely because of fate and a shortage of seven inch singles. After remixing I’ll Be Holding On by Al Downing, Tom took that remix to have an acetate cut. However, when the single was going to be cut, engineer Jose Rodriguez realized that there were no seven inch singles left, so cut it on a twelve inch single. When Tom saw this, he realized that it didn’t look right. It looked like a seven inch single on a twelve inch piece of vinyl. Then Tom hit on the idea of spreading grooves so that they reached the end of the vinyl. The effect this had was to increase the volume and dynamic range because the groove was much wider. This mean the music was much louder than other singles, resulting in clubs and DJs complaining that the single nearly blowing their speakers. This begs the question, why didn’t they just adjust the volume? Although they might have complained about volume, they liked the break midway through Al Downing’s I’ll Be Holding On. Everything bar drums and percussion dropped out and then the started to rebuild. This was Tom’s way of dealing with a key change. He gradually took out parts one by one, leaving merely drums and percussion. This breakdown grabbed the attention of record companies, DJs and dancers, with people asking why didn’t Tom put these breakdowns in other records. After this Tom would add breakdowns to other tracks, something that’s since been copied by remixers worldwide. However, the next step in Tom’s career would see him Philly bound, where he’d remix some of his most famous mixes for Philadelphia International Records, which cane be heard on Philadelphia Classics-The Tom Moulton Remixes. In 1974 Tom discovered the Philly Devotions’ I Just Can’t Say Goodbye on the Don De label. Having worked on the track at home, Tom took this to Columbia Records in New York. They loved what he’d done, and wanted him to remix the track. Although Columbia offered to send the tapes to New York, Tom decided to head to Philadelphia, having fallen in love with the Philly Sound. Once he’d moved to Philadelphia, Tom fell in love with the city and its slower pace of life. He was constantly in demand, once being booked into the city’s legendary Sigma Sound Studios for a year in advance. Having established himself in Philly, Tom hooked up with the two men who’d responsible for the Philly Sound, Kenneth Gamble and Leon Huff. Gamble and Huff and Tom Moulton met through The Trammps manager Harry Chipetz. At first, Tom thought that Gamble and Huff hadn’t any need for Tom’s help. However, eventually, Harry Chipetz brought Tom into the “Philly Family.” Initially, Harry brought the forthcoming albums about to be released, to see whether Tom could do anything with the music. The first song Tom chose was a People’s Choice track Do It Any Way You Wanna. However, when Tom first got involved with the Philly Sound, there was a backlash against with music coming out of Philly. The problem was some people in the black community felt that the Philly Sound was being transformed into music for white people with the addition of strings and horns. Tom like many people was amazed and even annoyed. Tom decided to make a point, but needed the right track. He chose the People’s Choice track Do It Any Way You Wanna, mixing it without strings or horns. This would dispel the accusation that Philly were making soul music for white people. He offered to do the song without taking a fee, but asked for his name to be put on the label, which it wasn’t. On the release of Do It Any Way You Wanna, it became a huge hit, reaching number one in the US R&B Charts, while reaching the top twenty in the US Billboard 100. This would be the start of a long and fruitful relationship between Tom and Philadelphia International Records. Gamble and Huff would supply the soundtrack to the seventies and early eighties, with much of this music being remixed by Tom Moulton. After the success of People’s Choice single Do It Any Way You Wanna, Harry Chipetz approached Tom with an idea to produce an album entitled Philadelphia Classics, complete with a cover of an old Rolls Royce on the album cover. This was because Harry saw the music as rich and classy, which it really is. There was one caveat, Tom couldn’t include M.F.S.B.’s Love Is the Message, as it had already been a hit. However, Tom wasn’t keen, because Love Is the Message was the track he desperately wanted to remix. Eventually, the label changed their mind, allowing Love Is the Message to be on the album. This changed Tom’s mind and his album of remixes went ahead, including Love Is the Message, the song which he’s most proud of. The resulting album was a huge success, and over the next few years, Tom became Philadelphia International Records’ go-to-guy for remixes. Tom remixed many of the label’s biggest singles. Indeed, thirty-one of them feature on Philadelphia Classics-The Tom Moulton Remixes. Given that they’re eight heavyweight vinyl discs in the Philadelphia Classics-The Tom Moulton Remixes-Special Vinyl Edition box set, I’ll now pick eight of the best tracks from this Magnus Opus. On the first album in the Philadelphia Classics-The Tom Moulton Remixes-Special Vinyl Edition box set, there are tracks from The Intruders, Robert Upchurch and Johnny Williams. One track stands out though, The O’Jays’ Back Stabbers, released on 8 July 1972, whilst Tom mixed the track in September 2011. It reached number ten in the US Billboard 200 and number three in the US R&B Charts. When released as a single, it reached number three in the US Billboard 100 and number one in the US R&B Charts. The introduction is extended by Tom. This means flourishes of piano, the Baker, Harris, Young rhythm section, complete with Norman Harris’ jazzy guitar. They’re combined with lush sweeping strings, the introduction is extended by Tom. This gives way to Eddie’s vocal. Soon, the lead vocal changes hands. Behind them a stunning arrangement unfolds. It’s an infectious combination of dramatic, yet beautiful music, thanks to the combination of lush strings, chiming guitars, piano and drums, while the horns and rhythm section deliver punchy, brief bursts of drama. When combined with the vocal the result is an O’Jays classic, made even better by Tom’s near ten minute masterpiece of a mix. Just like The O’Jays, Harold Melvin and The Blue Notes were another of the biggest groups on Philadelphia International Record. The Love I Lost one of their classic tracks. It’s from their Black and Blue album, released in September 1973. It reached number five in the US R&B Charts and fifty-seven in the US Billboard 200. When The Love I Lost was released as a single, it reached number seven in the US Billboard Hot 100 singles’ charts and reached number one in the R&B Charts. Originally it was meant to be recorded as a ballad, but Kenny Gamble the cowriter and producer asked the group to speed the song up, and sing it with a swagger. In doing so, this transformed the track. Keyboards, then chiming guitars enter, before the pounding drums and strings sweep in. Here, Tom extends the glorious introduction, building up the drama, and providing the perfect backdrop for Teddy’s impassioned vocal. Meanwhile, the rest of the group compliment his lead vocal with tight harmonies, against an arrangement that’s dramatic and emotive. M.F.S.B., Philadelphia International’s house band surpassing themselves, producing a impassioned and dramatic arrangement. Here, Tom Moulton extends the track to over twelve minutes, allowing you to revel in the emotion and sadness of a true Philly classic, as a seminal arrangement reveals itself. Apart from The Love I Lost, the second album contains M.F.S.B. featuring The Three Degrees’ T.S.O.P. and The Three Degrees’ Dirty Ole Man. Of all the tracks in the Philadelphia International back-catalogue, the one Tom wanted to remix was M.F.S.B.’s Love Is the Message, released in July 1974. Anyone who knows the track will realize why. Once Tom got the opportunity to remix the track in September 1976, this became a career defining track, lasting over eleven minutes. This is Tom’s Magnus Opus, the remix he’s most proud of. When the track opens it’s a mass of the lushest strings, blazing horns, percussion and the rhythm section. From its soulful beginnings, the track quickly decides to reveal its drama and delights. On the signal of the drums, a sizzling saxophone solo enter, while Lenny Pakula’s Hammond adds atmosphere. After that, the track briefly heads in a direction marked funk, before returning to its soulful sound. Later, the Three Degrees add their soulful strains, as the track combines soul and funk seamlessly. With Tom looping and extending parts, building up drama, then breaking it down, only to rebuild, no wonder he’s so proud of this track. He truly should be, it truly is one of his greatest remixes, one blessed with a contemporary, timeless sound, that sounds as good today as in 1976. Together with Tom’s remixes of The Trammps’ Love Epidemic and The O’Jays’ Love Train, this is one of the best albums in the box set. Billy Paul was Philadelphia International’s male superstar, releasing a string of successful albums, including 1974s War of the Gods, which reached number 110 in the US Billboard 200 and number twelve in the US R&B Charts. It featured The Whole Town’s Talking which Tom remixed in December 2011. He totally transforms the track. The tempo is quicker, with a myriad of swirling strings, percussion and the Baker, Harris, Young rhythm section combining, during an extended introduction, before giving way to Billy’s vocal. It’s soft, full of sadness and regret, accompanied by backing vocalists. Behind him, the strings sweep, while the punchy rhythm section inject drama as Billy’s vocal grows in power. Flourishes of piano, percussion and the rhythm section combine when Billy’s vocal drops out, before the strings rejoin and the track starts to rebuild. Tom’s decision to extend this part of the track and highlight the frenzied, flourishes of piano is a masterstroke. After that Billy and his backing vocalists rejoin, as the track heads to its glorious finish, with an emotive and impassioned vamp from Billy. Truly, this is an irresistible remix from Tom Moulton, the godfather of the remix. As if that’s not enough, there are remixes of The Trammps and Harold Melvin and The Blue Notes. Like so many of the albums in the Philadelphia Classics-The Tom Moulton Remixes-Special Vinyl Edition box set, choosing which one to write about wasn’t easy. Eventually, Harold Melvin and The Blue Notes won out over The Three Degrees and The O’Jays. Bad Luck was a track from Harold Melvin and The Blue Notes’ 1975 album To Be True. It reached number twenty-six in the US Billboard 200 and number one in the US R&B Charts, resulting in the group’s only album to be certified gold. The track has a bold, punchy introduction with the rhythm section, piano and percussion combining before Teddy’s powerful, passionate vocal enters. Strings enter, sweeping and swirling above Teddy’s vocal as he rues his Bad Luck. Then the rest of the group enter, contributing joyous, sweet backing vocals, as Teddy’s vocal takes centre-stage. Punchy, rasping horns enter as Teddy starts to vamp his way through this anthemic track. Like so many of Tom’s remixes, it has an irresistible, dramatic sound during its eight minutes. Not only has he the uncanny ability to know exactly what will work best, by extending and looping parts of the track, but his remixes have a timeless quality and are deserving of the work classics in the title. Lou Rawls’ You’ll Never Find Another Love Like Mine is one of his best known tracks. It’s from his All Things In Time album, released in June 1976. It reached number seven in the US Billboard 200 and number one in the US R&B Charts. When You’ll Never Find Another Love Like Mine was released as a single, it reached number two in the US Billboard 100, and number one in the US R&B Charts and US Dance Charts. What makes the track work so well is how Bobby Martin’s arrangement and Lou’s vocal unite. They compliment each other perfectly. Piano and rhythm section combine before Lou’s slow, smooth, sensuous vocal enters. As Lou sings, it’s almost call and response between Lou and the piano. He leaves a space which the piano fills dramatically. Then when the tempo increases, with drums, rasping horns and the piano adding brief flourishes of drama, Lou’s voice rises, becoming stronger, full of emotion and passion. Meanwhile, female backing vocalists cut in, their gentle voices a contrast to Lou’s powerful vocal. What makes this track is an arrangement that builds and builds. Layer upon layer of sumptuous music reveals itself, with the rhythm section and piano key to success of the track, with the horns adding just the finishing touch. Add to this Lou’s fantastic vocal, and the result is one of the best songs Lou Rawls ever recorded made even better by Tom’s magnificent mix recorded in September 2011. Despite quality contributions from The O’Jays, People’s Choice and The Three Degrees, nothing else comes close to Lou. Looking at the sheer quality of music on the seventh album, choosing one track isn’t easy. There’s Teddy Pendergrass’ I Don’t Love You Anymore and Lou Rawls gorgeous See You When I Git There. Eventually, I chose The Jones Girls, Nights Over Egypt, from their 1980 album Get As Much Love As You Can. Nights Over Egypt still retains the magical, timeless sound it had back in 1980. Opening with hissing hi-hats, the mystical, meandering introduction begins. A combination of synths, rhythm section, harp and acoustic piano combine. The funkiest of basses plays its part before the sisters unite to sing gentle, tight harmonies. Their voices grow in strength and power, as the arrangement peaks, before giving way to a lush, almost mystical and exotic sound, before lush strings sweep and swirl, as the vocal rejoins. Jack Faith plays flute on the track, while gentle, rasping horns escape from the arrangement. By the end of the track, you realize that you’ve been fortunate enough to hear a classic remix, never before released from the godfather of the remix, Tom Moulton, a true musical genius and innovator. 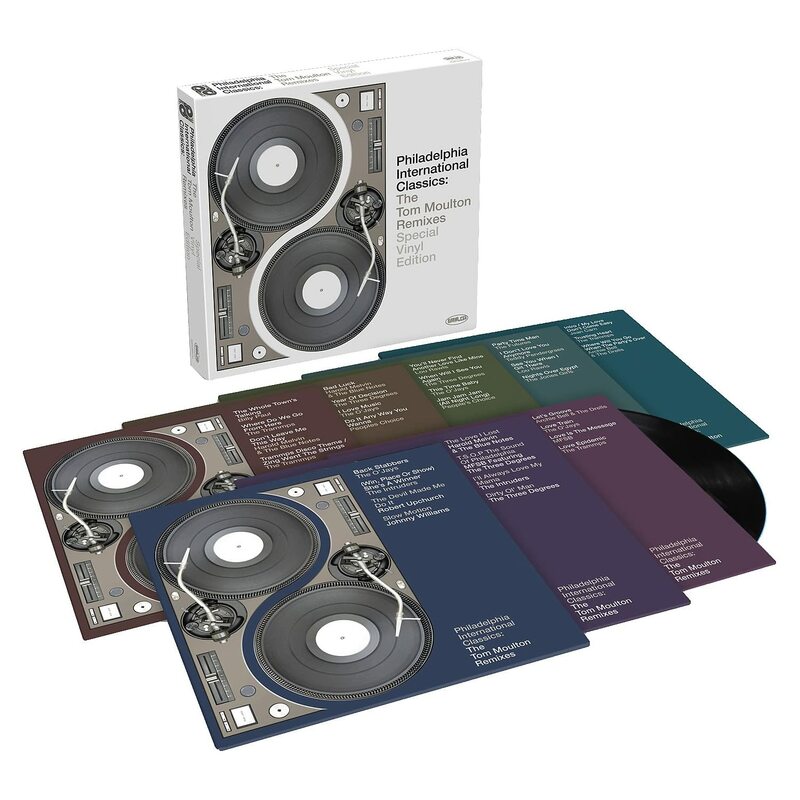 Each of the eight albums and thirty-one remixes that comprise Philadelphia Classics-The Tom Moulton Remixes-Special Vinyl Edition box set feature Tom Moulton d0ing what he’s been doing for five decades now, innovating musically. Never does the quality of music fall. Quite the opposite. Throughout the eight albums, the music on Philadelphia Classics-The Tom Moulton Remixes-Special Vinyl Edition box set is just as good. This demonstrates Tom’s talent as a remixer. It’s a combination of classics and new tracks, with the music is of the highest quality. With the new tracks, Tom’s remixes are just as good as his older remixes, demonstrating that he’s still a hugely talented remixer. In fact, listening to these tracks, there much better than anything the new generation of remixers are producing. Compare these tracks, and its like master and pupil, with Tom very much the master. Other remixers are just pretenders to Tom’s throne. For nearly forty years, Tom Moulton has been remixing music, with his remixes some of the most innovative and influential in the history of music. Without Tom Moulton, music, especially dance music wouldn’t be the same. There would be no remixes, no twelve inch singles and maybe, no superstar DJs. Instead, DJs would still be scrambling about mixing seven inch singles, with dancers suffering when the momentum they’d built up dropped as they’d just got into the groove. Of course maybe another DJ would’ve invented the remix, but would fate have intervened for them and the twelve inch single have been born? Who knows, but they wouldn’t have had the influence, skill and determination Tom Moulton would have on music. I doubt it. Truly, Tom Moulton is one of the real heroes of music. On 25 March 2013 Philadelphia Classics-The Tom Moulton Remixes-Special Vinyl Edition a stunning eight album box set of set of thirty-one of his remixes will be released by Harmless Records. This gives everyone the opportunity to either rediscover or discover the genius of Tom Moulton, inventor of the remix, twelve inch single and remixer extraordinaire. Standout Tracks: Harold Melvin and The Blue Notes The Love I Lost, M.F.S.B. Love Is the Message, Archie Bell and The Drells Where Will You Go When The Party’s Over and Teddy Pendergrass I Don’t Love You Anymore. ← ANITA WARD-SONGS OF LOVE. Incredible review. This needs to be in the liner notes. You have outdone yourself on this Derek!!! Your knowledge and background of Philadelphia International is amazing. I grew up in and around Philly, listening to a lot of the music you talk about here, and still was not aware of half of the details you provide. I really enjoy your blog when I get the chance to read it.